Thank you for joining me! 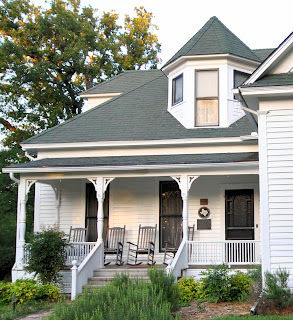 If you've been reading my blog for a while then you already know that we recently purchased an 1894 Farmhouse. 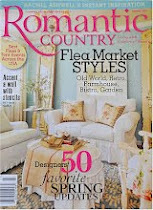 Our new place is the inspiration for this blog segment that is dedicated to all things related to Farmhouse Living. I've been sharing snippets of our new sweet place over the past couple of months, and although we are aching to dig our fingers into projects, we must wait until September after we've finished transforming the Shoppe. The product of that....as we've been moving things around, this cabinet has slipped under my skin. So much so that I find myself singing "I've Got You Under My Skin" in Ol' Blue Eyes fashion every time I walk by it. 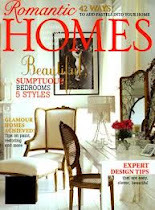 The result?....it has now become the inspiration for our future Farmhouse kitchen! Look at this big beautiful boy! It dates to the late 1800s, and is probably the best antique cabinet I've ever found in all my years of buying. Actually, my friend Tony from Town Square Antique Mall in Sulpher Springs found it for me. He's a gem....thanks Buddy! 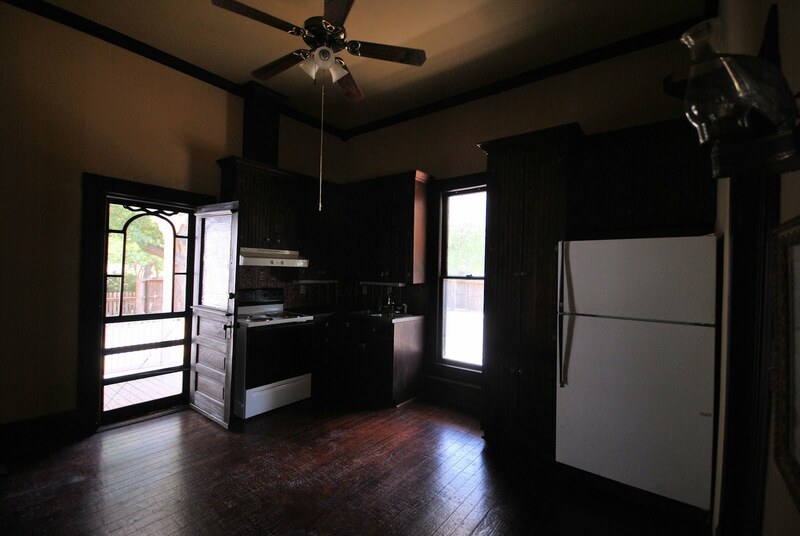 It's huge, measuring almost 9 feet tall and 8 feet wide so it needs an old kitchen with tall ceilings. We've got that covered! 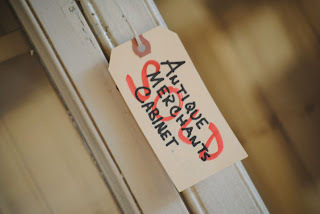 It seems fitting that this cabinet from the Shoppe end up in our Farmhouse, especially since it dates to right around the time this house was built....I love that! 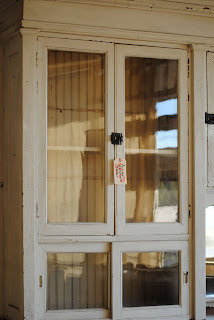 I also love these sliding doors on the cabinet! Okay, now, let me show you the before photos of our kitchen at the Farmhouse on Main. 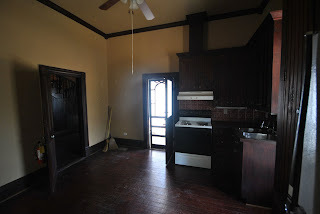 The original kitchen was removed and a new kitchen was added in the 1990s. It was designed to be the kitchen for a bed and breakfast. 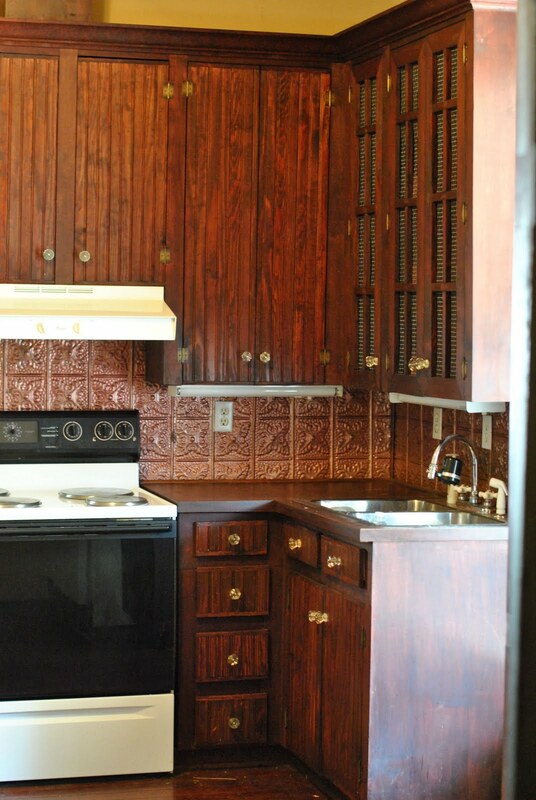 So, although it's lovely, it has very little cabinetry or counter space. And, it is missing many of the things we need for everyday living. Things like a dishwasher, garbage disposal, a pantry and storage, and we need washer / dryer hookups added somewhere in the house. These are things that weren't necessary for the previous owner because they did not reside in the house. My desire is to have a large farmhouse kitchen that looks as if it's been there for ages. But, with all the modern conveniences tucked inside. 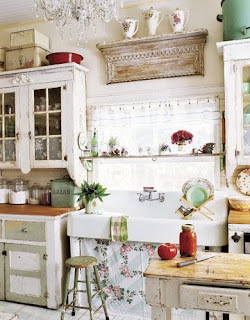 Are you feeling some Farmhouse kitchen love? 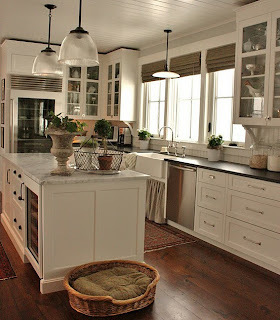 Several of my favorite Farmhouse sistas (as Anne calls it) have posted some farmhouse kitchen and cabinets love this week. Be sure to check out Anne and Becky, and you while you're at it, check out Debra, she has a wonderful new Design Challenge series that's really exciting! Now, it's your turn to share your Farmhouse love too! 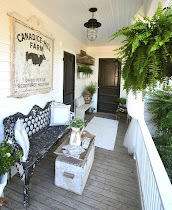 You don't need to have a farmhouse or even a vintage home to share, just a post that has something to do with Farmhouse living. Whether it be Farmhouse decorating, Farmhouse gardening, Farmhouse cooking, or just Farmhouses in general, we want to see it! Okay, let's get this party started, link up below and spread the word. 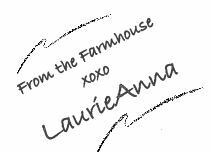 And, if you haven't already done so, be sure to enter my giveback for a $100 LaurieAnna's Vintage Home gift certificate here, I will announce the winner next week! Good morning, Laurie Anna. Thanks so much for hosting the party today. Can't wait to visit with all of the other party goers. Love it! I too adore old farmhouses! Thank you Ladies, I'm excited to host it! And thank you Lori, I love it too! I can't wait to follow along in the journey for all these vintage homes! I grew up on a Centennial farm in mid-Michigan we had a kitchen cupboard very similar to yours and a big farm kitchen. Seeing it brought back nice memories of coming home to a cookie jar with homemade cookies. I'm looking forward to following along on your journey! Does me being a nag while living with an old goat qualify as farmhouse living? Seriously...I think this is a lovely idea and I look forward to following along. P.S. Tony does find the greatest of treasures...but so is he. The cabinet is drop dead gorgeous!! 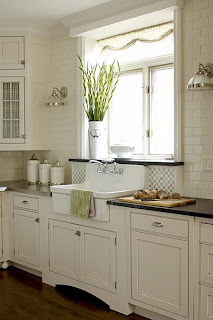 What a fabulous start to your farm house kitchen. Wish i had a big ole wall to put a cabinet like that in my kitchen. trying to link with your party, blogger says thumbnail didn't load...hope it does, but check out those romantic farmhouse kitchens! I am DYING, I love that cabinet!!!!!!! 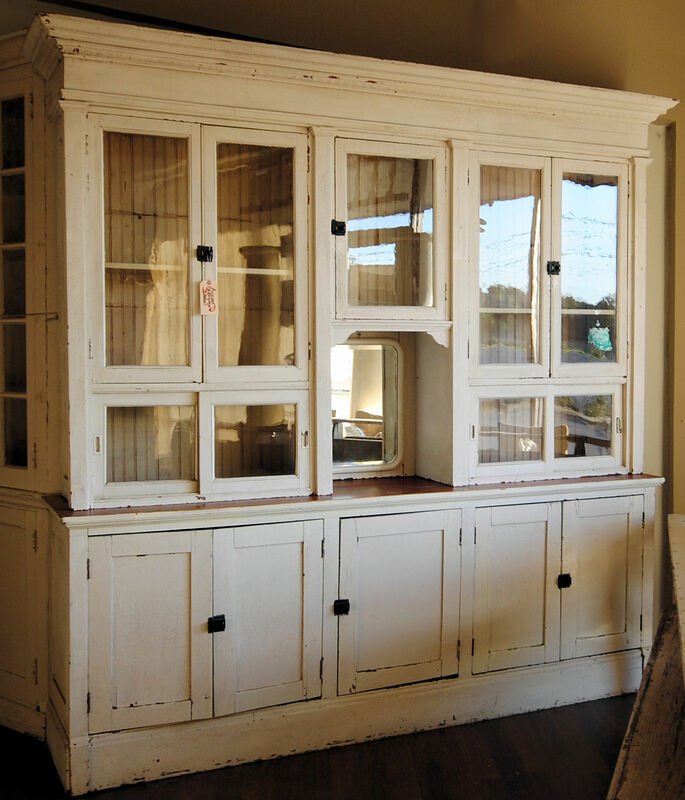 Glad you marked that cabinet sold..it will be wonderful in your new farmhouse...you have shown some great inspiration here. Just linked up my porch. 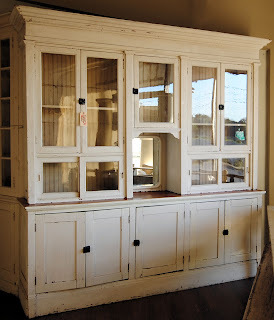 I have been searching high and low for a farm house cabinet just like the one you scored. 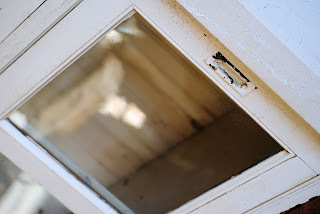 It's perfect and came full circle finding a new home in an old farmhouse! We haven't started our kitchen renovation yet. Thank you so much for letting me know about the packages I left at the shoppe. I was so busy visiting , I didn't realize I didn't have everything. Your cabinet is wonderful. I can't wait to follow your Friday progress reports. 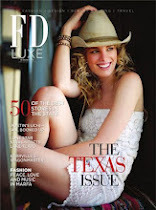 I grew up on a ranch, but my father farmed too. Maybe I can enter some recipes. I am definitely feeling the farmhouse love for sure! Love the cabinet! It is perfect! I am so excited about this new party...the ideas we will share! Of course, I love the cabinet...what isn't to love? 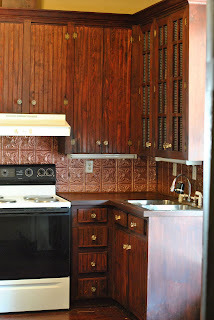 Aren't you glad that there aren't a lot of cabinets to tear out...this way you can start with a blank slate. Wow! What a beautiful cabinet, I can't wait to see what you do with that kitchen! That cabinet is amazing!! Can't wait to see more! You are an inspiration Laurie in more ways than one. Keep taking the high road, we see it. 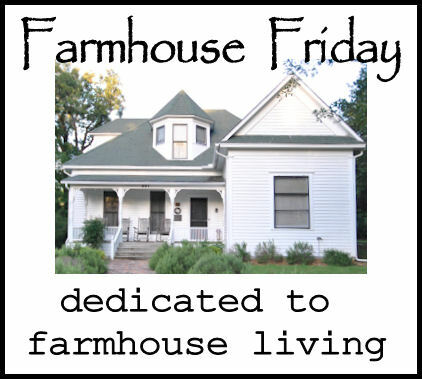 Thanks for creating Farmhouse Friday, I love it! 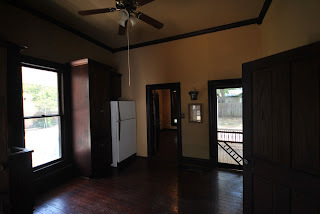 I can't wait to see your new kitchen! P.s. I love that cabinet! Oh wow, what a cabinet to build a kitchen around! 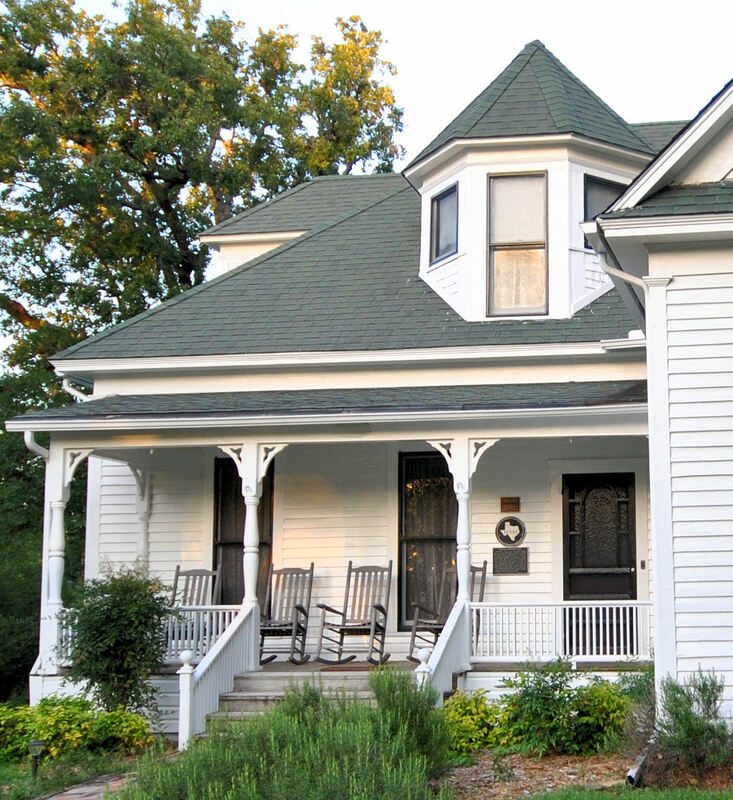 Your farmhouse is just beautiful! I'm excited to see what you do with it! It looks like you have two porch doors with screens in that kitchen, is that right? I love those screen doors! Your new place is beautiful! Love your new place, and have to say that I like the current kitchen, although I think it would be prettier painted and lightened. But, I see your point I would want those conveniences too especially the dishwasher! Love your blog! 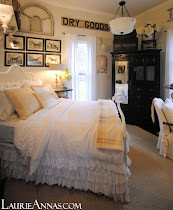 This is going to be wonderful, I love farmhouse decorating style! I'll be visiting every week! Your new cabinet is wonderful! Hey Laurie, you know I love that cabinet. It's going to look great in your farmhouse. Hope to join Farmhouse Friday if I can ever get the contractor to get started on our house. What a great party, I don't live in a farm styled home, but i do live in the Texas Country, and i have a few country details at home. i'm still on my way to learn more of all this life style. 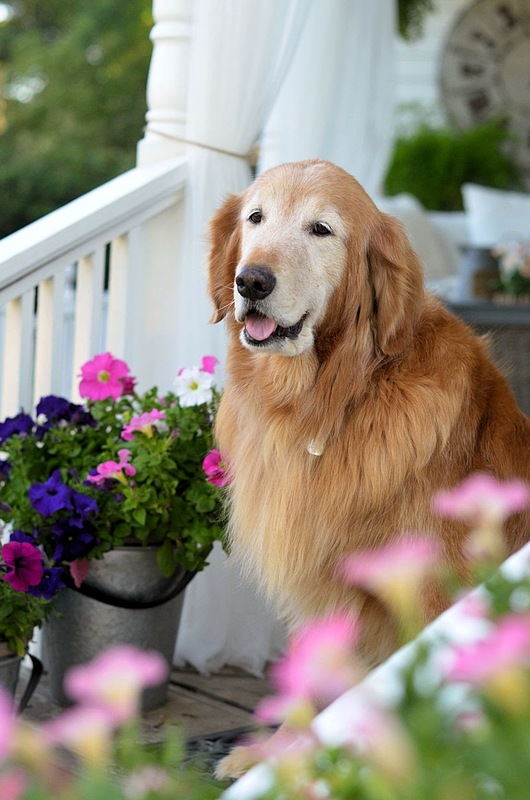 Thanks for Sharing your beautiful homes! 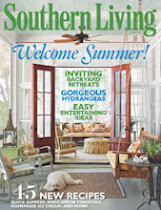 So glad Cozy Little House wrote about your blog today - I'm a new follower and have linked your blog. Looking forward to some good reading. That is one mighty fine cabinet for sure. The crackle finish is perfect. You got great points there, that's why I always love your site, it seems that you are an expert in this field. keep up the fantastic work, My friend recommends your site. Oh sweet friend, I am beyond sorry that I missed this on Friday!!! We were knee deep in getting our other house ready to sell, but I will be sure to NOT miss the next one. I had NO idea about this meme..will it be a weekly..? Hope it will. Your house is what ALL of us ladies dream of owning someday. So so glad for you that YOUR dream came true. If it is to be a weekly, you can count on seeing me here often. How blessed you are to have found such a beautiful old vintage home!!! 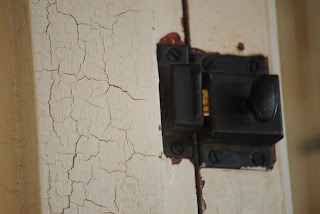 I, too, am drawn to the old, squeaky, chipped paint,feel....of an old home. But here in Oklahoma, they are hard to find in the country...strange isn't it? Maybe we haven't looked hard enough, I don't know. 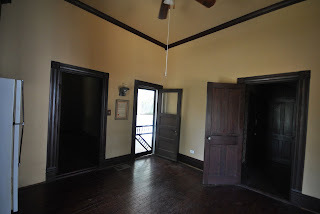 So we built a new farmhouse to look old..as much as our $$$ would allow...not quite the same. It's a beautiful home and I can't complain, can I? Even though my heart longs for an old one ;) Yes, you are blessed!!! Every time I see photos of your house and your ideas for the transformation....I sigh...with envy, with awe, with inspiration. :) That cabinet is going to be so absolutely perfect in your kitchen, girl - I could just scream! LUV IT! I am dying over your cabinet, that is an extraordinary piece!! 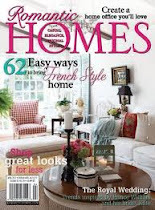 I can not wait to see your farmhouse transformation, I know it will be spectacular! This is a party after my heart. Your cabinet is very much like the one I have spent the better part of this week cleaning out and reorganizing. It was not original to my 1860s farmhouse, but was an addition in the early part of the next century. My kitchen is a 1960s after thought. It will never be a selling feature for this place but since I am here for the long haul I can live with it. It's lovely here and what a fabulous party! 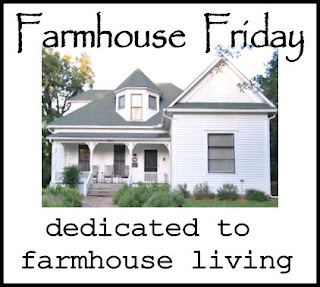 Love your farmhouse! 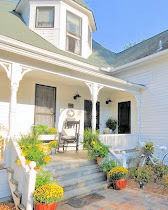 I recently bought a 1889 farmhouse. It needs a lot of work.I have it posted with pics on a new website. Please check it out. I could use advice and comments!